Choi IY, Piccio L, Childress P, Bollman B, Ghosh A, Brandhorst S, Suarez J, Michalsen A, Cross AH, Morgan TE, Wei M, Paul F, Bock M, Longo VD. 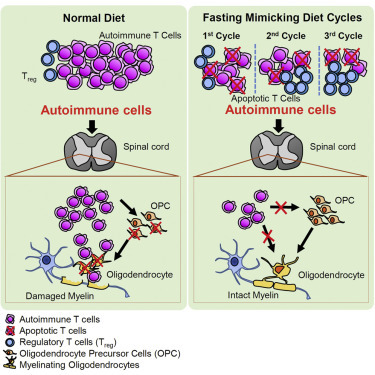 A Diet Mimicking Fasting Promotes Regeneration and Reduces Autoimmunity and Multiple Sclerosis Symptoms. Cell Rep. 2016. pii: S2211-1247(16)30576-9. Dietary interventions have not been effective in the treatment of multiple sclerosis (MS). 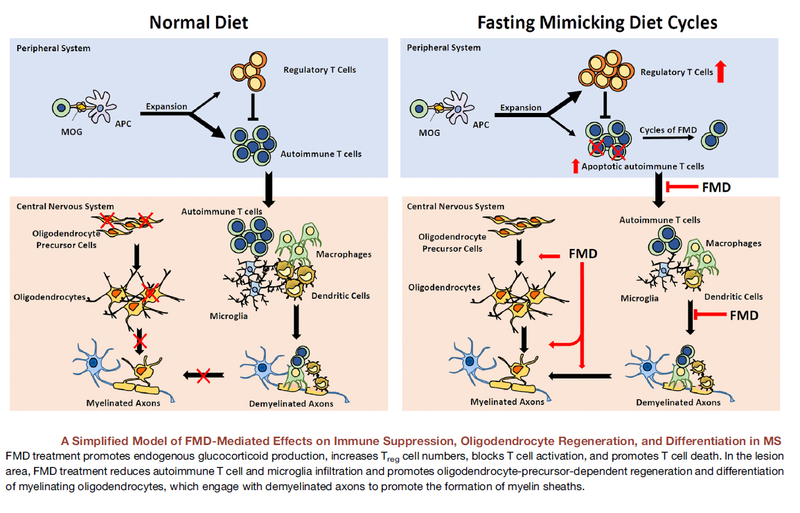 Here, we show that periodic 3-day cycles of a fasting mimicking diet (FMD) are effective in ameliorating demyelination and symptoms in a murine experimental autoimmune encephalomyelitis (EAE) model. The FMD reduced clinical severity in all mice and completely reversed symptoms in 20% of animals. These improvements were associated with increased corticosterone levels and regulatory T (Treg) cell numbers and reduced levels of pro-inflammatory cytokines, TH1 and TH17 cells, and antigen-presenting cells (APCs). 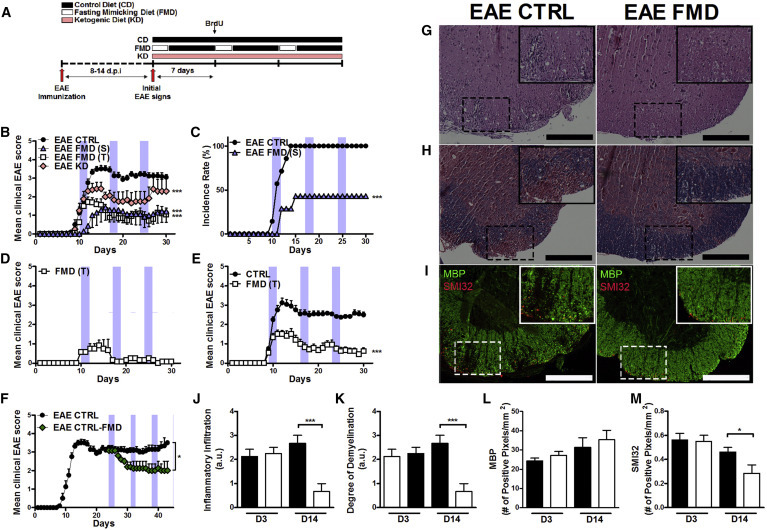 Moreover, the FMD promoted oligodendrocyte precursor cell regeneration and remyelination in axons in both EAE and cuprizone MS models, supporting its effects on both suppression of autoimmunity and remyelination. We also report preliminary data suggesting that an FMD or a chronic ketogenic diet are safe, feasible, and potentially effective in the treatment of relapsing-remitting multiple sclerosis (RRMS) patients (NCT01538355). Prof G has just posted on fasting diets and hot on its heels is this new study. In this study they report that if you starve mice with a fasting diet, then their stress levels increase and they don’t get EAE. Do the mice know it is a fasting diet or are they stressed that they aren’t getting enough food. When you have food on tap and all of a sudden it stops, this is stressful and stress stops EAE. Too much water does this; building work does this, other things do this and now diet does it. As we are being advised to feed the beasties on Jelly and condensed milk to fatten them up before EAE and give energy injections it is interesting that data shows that the opposite may be protective. Counter intuitive? But data is data. So 60 patients were randomly assigned to a control diet (CD; n = 20), KD for 6 months (n = 20), or a single cycle of a modified human FMD for 7 days (n = 20) followed by a Mediterranean diet for 6 months. During the 6-month study period, we observed a total of eight relapses: four in the CD group, one in the KD group, and three in the FMD group. Therefore it can hardly be said that this data indicates efficacy as there is no difference between FMD and control diet in terms of relapses. But the study is too short and too small to make any real comments. However the claims are assessed are based on improvements on quality of life. But the study is too short and too small to make any real comments. However the claims are assessed are based on improvements on quality of life. I find it hard to believe that the effect of fasting on a rodent can say very much about fasting in a human. I think this intriguing power theme in MS. What was he trying to say, or not say? I personally know 05 people who turned bodybuilder and 4 that have become triathletes after the discovery of the disease, and all are restrictive diets or directed. Only 02 of them teveram relapse after these 02 years in which I keep in touch with them. Most adopt diets with the DMTs, and just these two people who had relapses do not use DMTs, only diet, but it has consequences, and one of them has MS 10 years ago. Low Fat diet or Paleo diet..who knows..??? overweight vs. underweight might reveal something.